Ah, that isn't what I meant. My Amazon version shows 12 hours for 100 SkullMage shards. TheW83's list at the start of this topic shows 8 hours (I assume Android). Differences between Android and Amazon versions of COL2? Will upgrading to higher levels of the Alchemy Workshop reduce time from 12H to 8H for Skull Mage shards? I'm only at Level2 of the Alchemy Workshop. My data was wrong. Fixed it. Added more info thanks to Rubra. What do you mean "For each 600* souls spent on mercenaries you get 1 magic dust"? Yeah you can't directly trade souls for dust/powder but you can with a carrier hero. 1. Glory your heroes for equal dust return per hero used (e.g 130 dust (65 x 2) for a one glory BB) but takes less stamina than dusting two singles. This gets more stamina efficient the more glory used, same dust return always." Just turned 13 SC into one lvl 31 max glory SC - only worth 607 powder instead of 845 plus however much for exp. As you can see, giving him 1 Glory gains you an aditional 2 powder, but after that you get deminishing returns. Therefore, it's not cot effective to salvage any hero higher than 1 glory. Interesting stuff ! - thanks, sure W83 will update to say go to one glory only. I updated the tips. Thank you! Since the WS gives random extra amounts wouldnt it be more economical to also just do them individually and have more patience? even if just one of 13 gives double powder I think it would be worth the wait. That's odd. 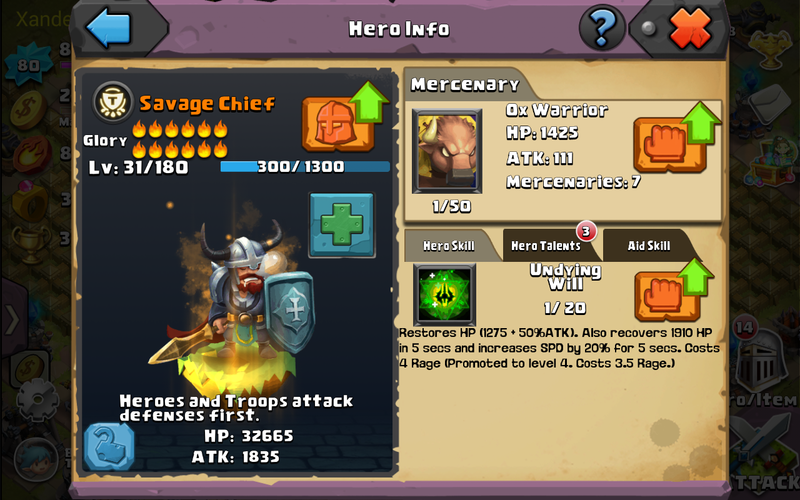 A single lvl 1 savage chief will give you 65 dust. 13 of them (12 glory+original) should give 845. I'd say there's maybe a 15-20% chance of doubling so odds are you'll probably have at least one double if done seperately which would give you 910 total. The only way to get better with yours is to get lucky and double to 1200. Passive skills do not give any extra dust btw. Good to know. Disappointing but good to know. DS is 151 in case anyone is desperate enough (brain damaged?) 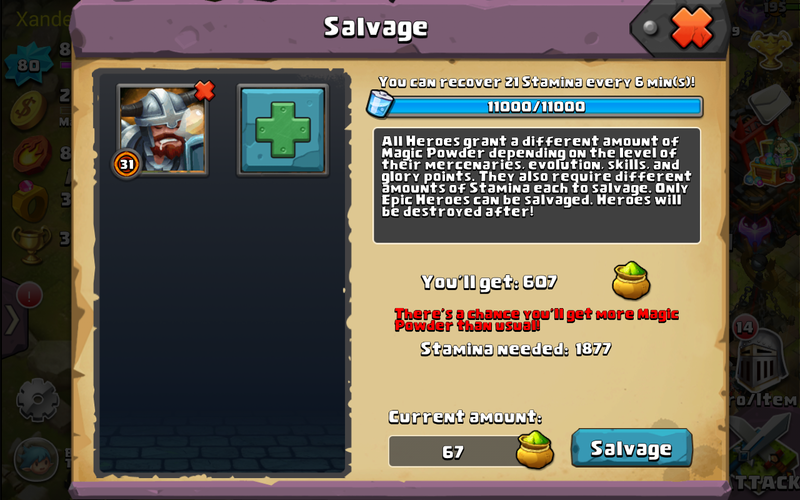 to salvage him..
Fun fact: If you salvage several heroes at once and are lucky enough to have it doubled, it doubles for all the heroes you salvage. In my case I had 2 blitz bombers worth about 400 dust each, and I got 1600 dust for them (approximately). Yeah thats kinda like putting it all on 23 in roulette. From my tests it seems around 15% chance to double.